Educational Qualification :- Degree in Civil Engineering from a recognized University / Institute and Valid Graduate Aptitude Test in Engineering (GATE) Score in Civil Engineering discipline. NHAI Selection Process :- Selection will be based on GATE score & Interview. 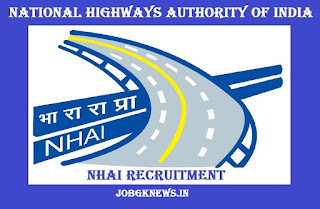 How to Apply NHAI Job Vacancy :- Interested Candidates may appear for Interview along with prescribed application form and all the original documents/certificates such as mark sheets/experience certificate, in support of age, educational qualifications, experience, VALID GATE Score Card & A set of self-attested copies of each of such documents and a recent passport size photograph at the time of Interview.